Dust off that old guitar! Have you always wanted to play the guitar? Whether your style is the blues, classical, rock, jazz or alternative, Jonathan Kasper specializes in making the basics fun and easy. 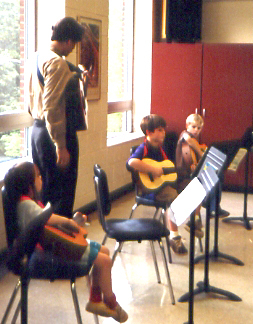 Jonathan's unique curriculum also includes basic music theory, creative improvisation, and songwriting. Students also learn how to read music, tablature and chord charts. We recommend that you fill out our easy online Enrollment Application as a first step. Or feel free to give us a call: 615-383-8516. Once we've received your completed application, we can schedule an initial lesson. It takes time and patience to master an instrument. But when you're on the journey of musical discovery, that's where all the fun and creativity begin. Progress is made with regular practice outside of lessons. It is helpful to have parents or older siblings occasionally assist young students at home. 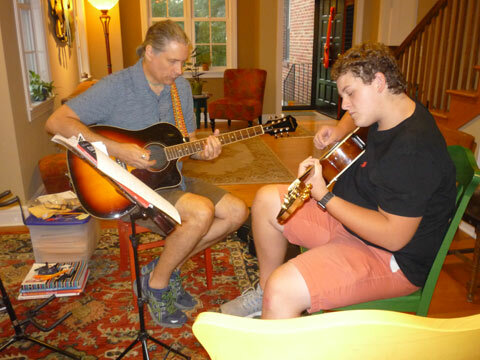 Students choose either Private or Small Group Guitar Lessons*, depending on scheduling and other considerations. Make your selection when registering on our interactive Enrollment Application. Students are also welcome to take shared lessons with friends or family members. 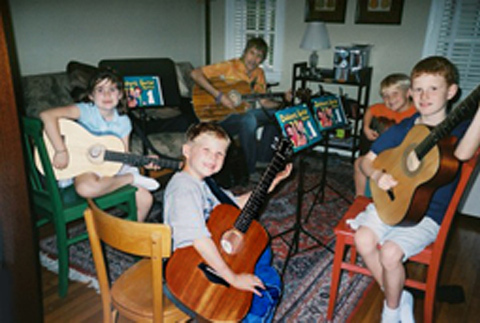 Small Group Guitar Lessons* are an exciting way for children and adults to learn an instrument in a supportive, self-paced environment. The curriculum is comprehensive and fun, everything from reading to rock-n-roll. Children enjoying a Small Group Guitar Lesson in Mr. Kasper's home guitar studio. Your child can begin guitar instruction as early as pre-K, though starting in kindergarten is more common. At our conservatory, we love planting seeds of musical excellence and watching our talented sprouts grow. Class size is kept small to give maximum attention to each individual. New students will be integrated into standing classes whenever possible, to provide the greatest opportunity for peer learning. All guitar students are invited to perform for friends and family in an informal Guitar Recital at the end of the school year (late April/early May). To get started with lessons, please fill out our easy online Enrollment Application. See additional information on Small Group Lessons in the blue box below*. Children taking a Small Group Guitar Lessons after school with Mr. Kasper.